One seat remaining as of Apr 20, 2019 7:59 pm PDT. Seats remaining may change at any time prior to registration and payment. Discuss the contribution of the psychoanalytic, trait, behavioral and humanistic perspectives in explaining the various aspects of personality and its assessment. Describe the etiology of psychological disorders from the various psychological as well as biological perspectives and identify the distinguishing features of anxiety disorders, mood disorders, schizophrenic disorders, personality disorders, dissociative disorders, somatoform disorders, and substance-related disorders. Describe the various methods of therapy for psychological disorders from the psychoanalytic, behavioral, cognitive, humanistic, and biological perspectives. Describe the research findings regarding the nature of stress, reactions to stressors, the impact of stress on health, and effective coping and stress management techniques. Describe current research findings examining the various psychological and biological components involved in emotion, with a focus on aggression and anger. Describe the current theories regarding the biological factors involved in various motivational states, with a focus on attachment and sexual motivation, as well as achievement motivation. Explain current developmental perspectives and research findings regarding cognitive, physical, and social changes which occur across the lifespan, from conception to old age. Explain current research findings and theories examining the manner in which social behaviours of individuals can be influenced by the presence and behavior of other people, as well as factors involved in the formation of attributions and attitudes about others and the self. Describe general findings on cultural differences and factors which influence cross-cultural relations. Describe basic research findings regarding the nature of thought and intelligence. 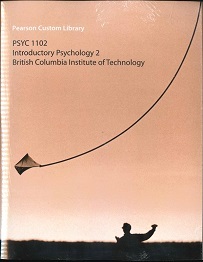 Interested in being notified about future offerings of PSYC 1102 - Introductory Psychology 2? If so, fill out the information below and we'll notify you by email when courses for each new term are displayed here.